Someone once told me that the state of one’s room reflects the state of that person’s mind. The other day, I remembered this when I looked at how messy my apartment had become – the stacks of books collecting dust, clothes that I never wore and the souvenirs from various events and conferences I didn’t know what to do with. Like many people, when I deem something worth keeping at some point, I don’t second-guess that decision ever again. 1) Holding onto things is my default setting. 2) I don’t re-evaluate what I’m doing as frequently as I should. 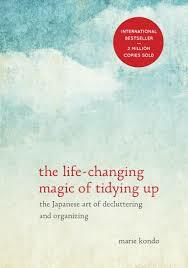 That’s part of the reason I read Marie Kondo’s book, The Life-Changing Magic of Tidying Up. After reading the Wall Street Journal’s review of this book, I could tell it was much more than just an organizational guide – that, instead, it took a more holistic angle to cleaning. Kondo instructs readers to discard things that don’t “spark joy.” Take each of your possessions in hand, she writes, and observe how you feel about each one. If it’s something you once loved, but no longer want, she tells readers to thank the item for doing its job and discard it. When reading Kondo’s forceful and enthusiastic directions, I remembered how difficult it was to say goodbye when I moved into a new apartment a few months ago. All my possessions passed through my hands as I packed them away into boxes and unpacked them later. A few things were easy to toss. But for most things, like old clothes, posters and books, I just remembered how much I had once valued them. Saying “thank you” would have made it easier to let them go. Constantly re-evaluating your feelings is not easy to do. Heidi Grant Halvorson, author of No One Understands You and What to Do About It, explained this phenomenon on a recent Harvard Business Review podcast. “One of the things we know about the brain is that it’s very very good at ignoring or reinterpreting things in order to be consistent with what it already thinks is true,” she said. In a way, we’re all like frogs in slowly boiling water: we often can’t tell when things are bad for us until we reach some kind of cataclysmic breaking point. In an interview on This American Life, Tina Dupuy referred to the same problem. She had always identified as an alcoholic, only to find out later in life that she wasn’t. “One day it occurred to me that everything doesn’t happen for a reason. What it is is that everything happens, and then we assign a reason to it,” she said, explaining how she found ways to reinforce old beliefs she had about herself, even when they weren’t true. Sure, that may just be the way our brains are wired. But it’s also a habit worth challenging. I have about 10 boxes from my move I have never unpacked. I forget what things are inside of them, but whatever they are, I can honestly say I haven’t missed them. It’s probably time to go through them and let go. Photo from Swedish Heritage Board.